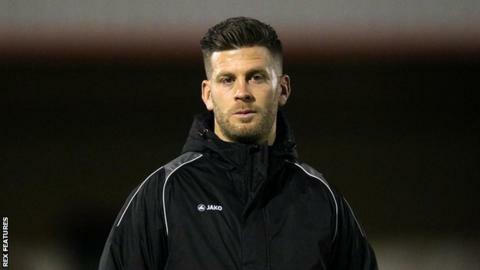 Boreham Wood's 0-0 draw at home to Macclesfield saw them fall into the National League relegation zone. In a nerve-stricken performance, Boreham Wood struggled to create anything at a quiet Meadow Park. The Silkmen had the game's best chances, as Chris Holroyd tested Boreham Wood's James Russell before Kristian Dennis fired wide. Harry White had the Wood's best chance, shooting over the bar as neither side could break the deadlock. Match ends, Boreham Wood 0, Macclesfield Town 0. Second Half ends, Boreham Wood 0, Macclesfield Town 0. Attempt blocked. Chris Holroyd (Macclesfield Town) right footed shot from the centre of the box is blocked. Substitution, Macclesfield Town. Dan Cowan replaces Danny Whitehead. Substitution, Boreham Wood. Ricky Shakes replaces Luke Howell. Foul by Danny Whitehead (Macclesfield Town). Attempt missed. Danny Whitehead (Macclesfield Town) right footed shot from outside the box is too high. Attempt saved. Reece Styche (Macclesfield Town) right footed shot from the right side of the box is saved. Assisted by David Fitzpatrick. Substitution, Macclesfield Town. Reece Styche replaces Jack Sampson. Substitution, Boreham Wood. Danny Haynes replaces Junior Morias. Harry White (Boreham Wood) wins a free kick. Substitution, Macclesfield Town. Danny M. Rowe replaces Danny Whitaker. Attempt missed. Harry White (Boreham Wood) left footed shot from the centre of the box misses to the left. Clovis Kamdjo (Boreham Wood) wins a free kick. Attempt missed. Kristian Dennis (Macclesfield Town) right footed shot from the right side of the box misses to the left. Ben Nunn (Boreham Wood) wins a free kick. Attempt missed. Callum Reynolds (Boreham Wood) header from the centre of the box misses to the left. Assisted by Conor Clifford. Foul by Kristian Dennis (Macclesfield Town). Callum Reynolds (Boreham Wood) wins a free kick. Foul by John McCombe (Macclesfield Town). Junior Morias (Boreham Wood) wins a free kick. Second Half begins Boreham Wood 0, Macclesfield Town 0. First Half ends, Boreham Wood 0, Macclesfield Town 0. Attempt missed. Luke Howell (Boreham Wood) right footed shot from the right side of the box misses to the right. Offside, Boreham Wood. Harry White tries a through ball, but Harry White is caught offside. Offside, Boreham Wood. Junior Morias tries a through ball, but Junior Morias is caught offside. Foul by Jack Sampson (Macclesfield Town). Attempt saved. Kristian Dennis (Macclesfield Town) right footed shot from outside the box is saved.